Note: HyperGrid and Oculus viewer information for experienced users at the bottom of this page. 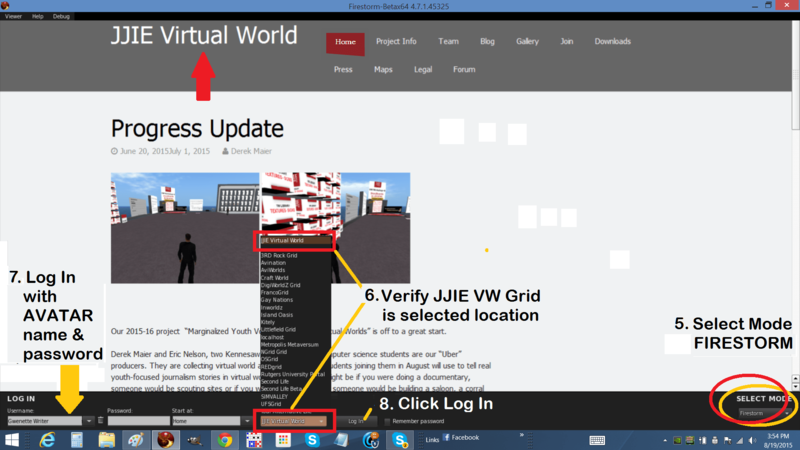 The JJIE Virtual World Grid project recommends the Firestorm Viewer for avatars to enter our world. We can offer technical support to anyone logged in using Firestorm Viewer. It is recommended you create your JJIE Virtual Wolrd avatar account before downloading the viewer. Then your avatar’s name and password are ready and you can log into the world immediately. Note that when first opened, the Firestorm Viewer may ask you if you want to create an account. Do not use those links. Create your JJIE avatar account here. READ CAREFULLY to verify you are downloading the version for your operating system AND for use in OPENSIM. Install and open the software. It will open to the viewer splash page with the Firestorm logo. The viewer is designed to log you into several different virtual worlds. 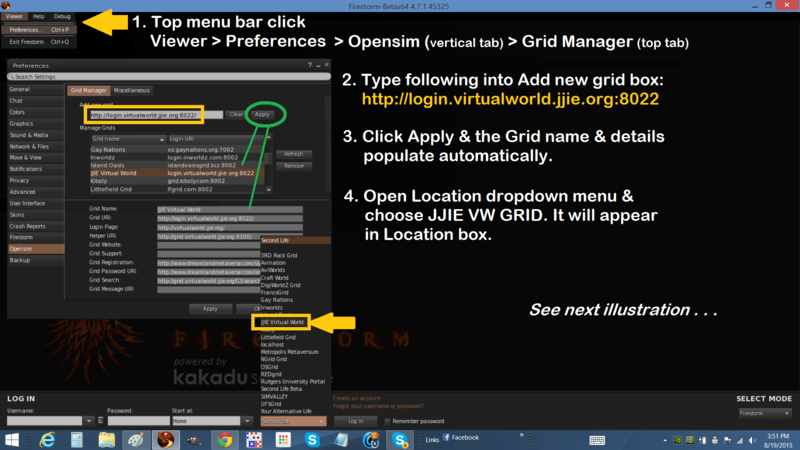 Now, you must add the JJIE VW Grid to your Firestorm Viewer Location menu so you will be able to access the JJIE VW Grid. Remember, to enter/login to the JJIE Virtual World Grid you must first create a JJIE Virtual World Grid avatar account or arrive via HyperGrid using an avatar from another HyperGrid-enabled opensim world. The JJIE VW Grid hypergrid address is: http://hg.virtualworld.jjie.org:8022 Note: This is NOT a website address, but an address to use in your viewer’s map search box when on other grids to HyperGrid teleport into the JJIE Virtual World Grid. Bleeding Edge Oculus users can find the compatible 3D OpenSim viewer, CtrlAltStudio, here: http://ctrlaltstudio.com/. Please note we do not offer tech support for this viewer, but welcome emails about your experiences using Oculus in the JJIE Virtual World.